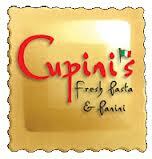 When you think of Cupini’s, think family and great food. Since 2003 Cupini’s has been providing Kansas City with fresh pasta, sauces, salad dressings, and deserts all made in house everyday (full menu). Cupini’s is a true family business and restaurant that cares about our service and quality. Download the free Lantern App to get a great first time offer from Cupini’s and be sure to check in each time you dine to start earning loyalty rewards. “Fresh flavors dominate” at this “tiny” Westport Italian deli and grocery whose “amazing” pizza, pasta and panini outshine its “unassuming looks” and “cafeteria-style” service; it “won’t break the bank” either, especially since it’s BYO with no corkage fee.